The link between stability and speed in boats is very strong, and nowadays most people are aware of the fact that thanks to their improved stability, multi-hulls are faster than comparable mono-hulls under sail as well as motorized. In the mono-hull form, most of the hull’s volume is concentrated along its center line, where it contributes nothing to lateral stability. In the twin-hull (a.k.a. catamaran) form, the boat’s volume is split in two, and each half is distributed along the boat’s sides, where it works effectively to increase the sides’ buoyancy and thus the boat’s overall lateral stability. In other words, when stability is concerned, the mono-hull form is wasteful, and the twin-hull form is efficient. In order to better understand this principle, consider small fast vehicles that have no stability of their own, such as bicycles and motorcycles – Without a biker to balance them while in motion or standing in place, these vehicles would fall on their side. This said, such vehicles offer excellent means for their operator to balance them, and this balancing capability is enough to allow these vehicles to move at high speeds and over rugged terrain. A similar, although reduced effect can be observed in other small, high-performance vehicles such as ATVs and snowmobiles, which offer their operator and passengers excellent means to balance themselves, and by doing so enhance the stability of their vehicle as well. Personal watercraft (PWC) are the aquatic version of these powerful and fast land vehicles. So what do all the above mentioned small vehicles have in common in design and ergonomic terms? -They all feature a saddle type of seat. Typically, bikes and motorbikes feature higher saddles than ATVs, snowmobiles and PWC, but this is not always the case, since some bikes and motorbikes feature lower saddles. In any case, saddle seats differ from other seats by the fact that their user rides them with a leg on each side, and does not sit on them with their legs in front of them. Ergonomically speaking, this allows the user to react to lateral changes intuitively, more quickly, and more effectively, and thus balance themselves and their small vehicle more efficiently. 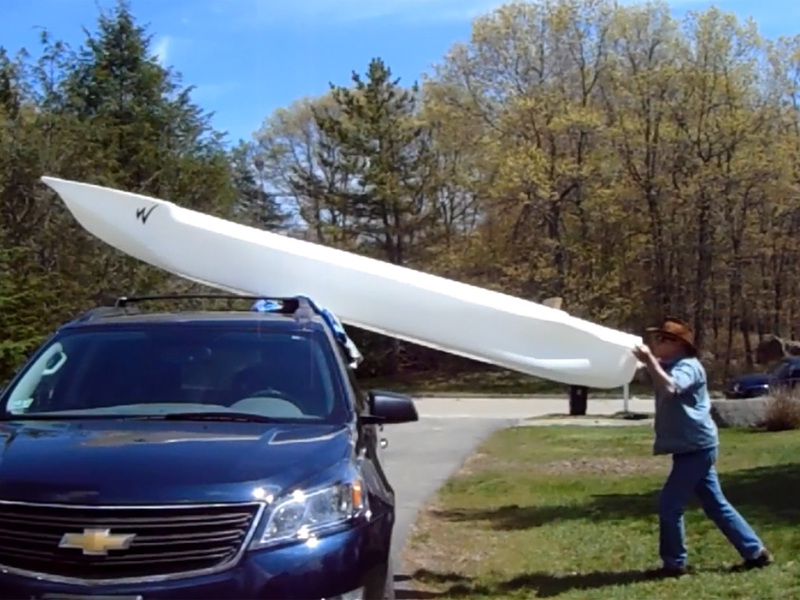 The patented Wavewalk small watercraft (kayak, canoe, skiff, etc.) is unique in the sense that it combines a twin-hull (catamaran form) with a saddle seat that’s similar to the ones featuring in large-size PWC. Thus, Wavewalk kayaks are more stable, and they an be better balanced than any other kayak, canoe, or other small vessel of comparable size. This overall stability, namely the combined static stability of the boat and dynamic stability of its users, allows for unrivaled performance in speed terms, as well as in seaworthiness. This video shows the kind of speed offered in the ocean, in rough water, by the Wavewalk S4, which is currently the world’s most stable as well as fastest kayak. This video shows Captain Larry Jarboe, the current holder of the world speed record for motorized kayaks, driving his Wavewalk S4 at 17 mph (27 kmh) on flat water. Note that Captain Jarboe drives his motor kayak seated in the side-saddle position, and not in the more stable riding position. This is to say that from an ergonomic standpoint, he does not feel a need to take full advantage of the S4 design. A vessel designated as a kayak does not necessarily have to be a lame, unstable, uncomfortable, and slow one. It can be a fast, comfortable, and most seaworthy one, as demonstrated here. This performance level opens new possibilities for using these “kayaks” for offshore fishing, rescue and engineering, as well as boat tenders and fun boats. Such a braod performance envelope is unique to the Wavewalk S4, which on top of these motorized applications, can serve as a wonderful paddle craft, both in a kayaking and canoeing mode, for one, two, or three passengers, seated and/or standing. And last but not least, unlike other fast and stable motorboats, the Wavewalk S4 does not require transportation by trailer. At 98 lbs (45 kg) without the motor, it can be car-topped by one person on the roof rack of any vehicle, carried to the beach, and launched practically anywhere. What is a portable boat? A portable boat is a small, lightweight boat that can be easily transported on the roof of a common passenger vehicle, and carried by hand to the water and back from it by one or two persons. Portable boats are also referred to as car-top boats. By definition, a portable boat does not require a trailer for transportation. But when portability is concerned, not all trailer-free boats are equal, and some boats (e.g. small dinghies and Jon boats) and motorized boards are small and lightweight enough to be hauled onto a pickup truck bed, but too heavy and bulky for car topping and easy carrying, which is why these vessels are not considered as portable boats. Kayaks are small vessels that are typically lightweight enough to be car topped and carried by hand, but since kayaks don’t lend themselves to effective motorizing, they are not considered as boats, and the same is true for most canoes, with the exception of very wide, square-stern canoes that can be driven on flat water with a small outboard gas motor. 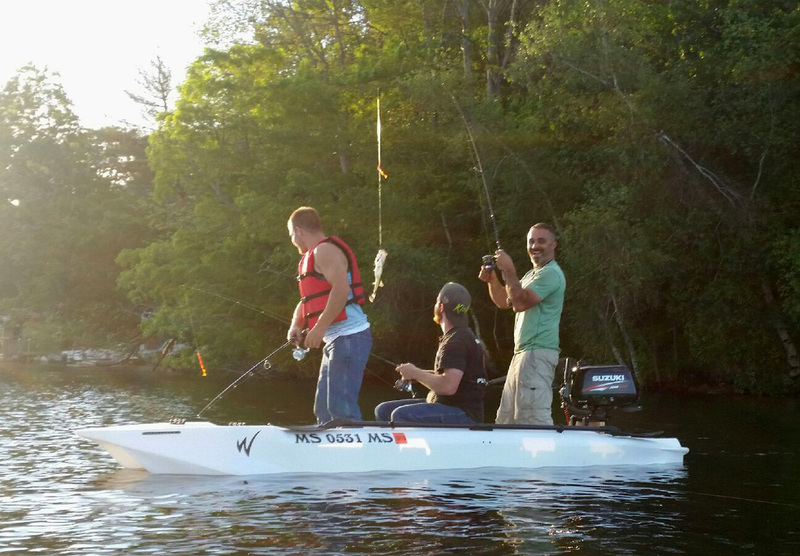 Kayaks equipped with electric trolling motors are still considered to be kayaks and not portable boats, similarly to bicycles that are not designated as motorcycles even when outfitted with small motors. A motorized board labeled as a skiff for a solo user would not qualify as a portable boat even if in the future a lightweight enough version of it is produced, because it lacks the load capacity and free board that are expected from a boat – even a small one. In sum, in order for a vessel to qualify as a portable boat, if must be both a fully functional boat and fully portable. Portability has advantages both in economic and time terms. In dollar terms, portability offers you to save the money that you would have had to spend on a boat trailer, and spend it on the boat itself, and on other useful equipment such as electronics, fishing gear, etc. More importantly, a portable boat makes you gain productive, fun time on the water that you would have otherwise spent driving to or from a boat ramp, which is the only place where you can launch a boat from a trailer. A portable boat also saves you time waiting at a boat ramp to launch your boat, and waiting for others to launch their boats or take them out before you can take out your own boat. Not having to depend on boat ramps guarantees that you’d never drive to a boat ramp just to find that there’s no more parking space left there for your vehicle and trailer. Some dinghies, Jon boats and square-stern canoes are small and lightweight enough to be car topped. They are made from aluminum, fiber reinforced plastic (FRP) – typically fiberglass, or polymer resin (plastic) such as Polyethylene. Having a rigid hull means that these boats are ready to be driven without additional work such as inflating and/or assembly, and once the trip is over, they can be car-topped without deflating and/or disassembly. The only difference between a car-top boat and a boat transported on a trailer is that a car-top boat requires mounting the outboard motor on it before launching, and dismounting it after the end of the trip. 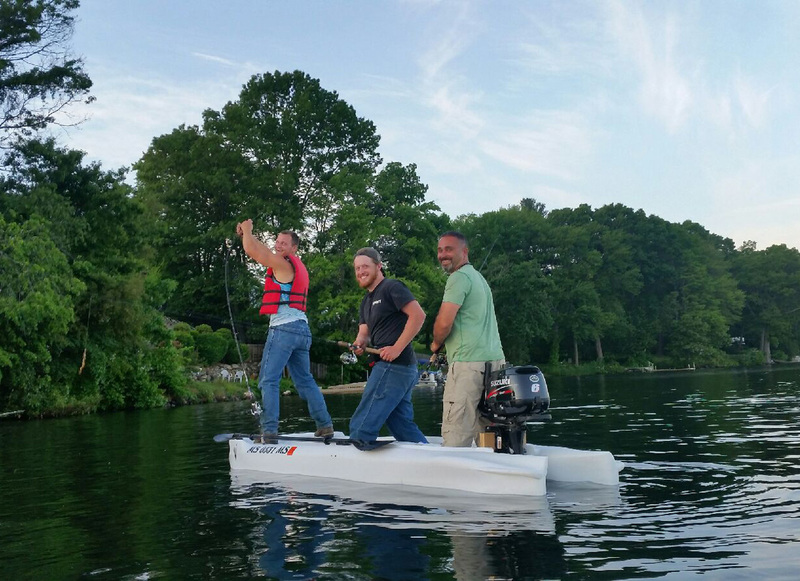 For an experienced boater, mounting the motor and dismounting it takes a couple of minutes. Some inflatable dinghies are made solely from soft parts, and others, namely rigid-inflatable boats, or RIB, include rigid components as well. This requires inflation and assembly before launching, and disassembly plus folding upon return from the trip. These activities take time, even if you’re experienced and equipped with a good electric pump. 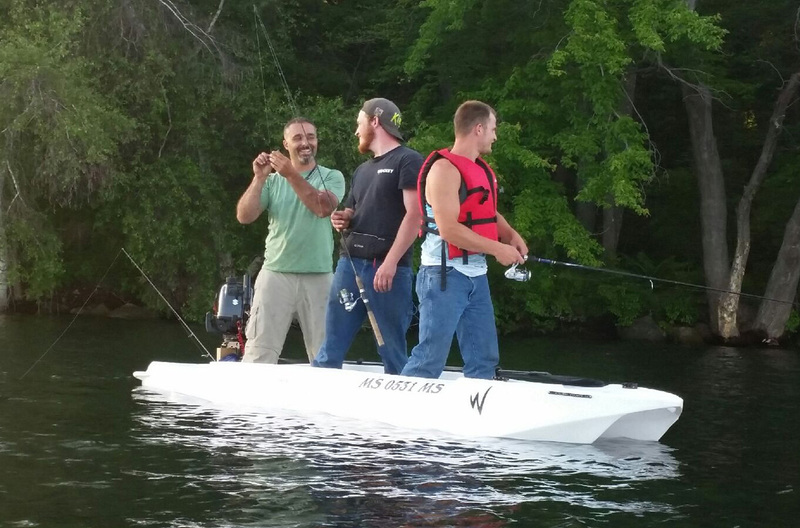 Inflatable boats are not very popular among anglers, who prefer to avoid fishing from a boat whose hull might be perforated by a fishing hook, a knife, or other sharp object that anglers typically carry on board. Some small catamarans feature rigid hulls (pontoons, actually), and they can be disassembled and transported in sections, on top of a car roof. Typically, such catamarans are used for sailing, and they are rarely used for fishing and hunting. Canoes are either round bottomed or flat bottomed. The first type of hull is extremely tippy, especially for a crew of more than one passenger, while the second type is moderately stable on flat water, and unstable on moving water. Portable Jon boats and rigid dinghies that feature a flat bottom are moderately stable on flat water, but not stable enough for trips or fishing in moving water, or in the presence of wakes from big motorboats. Portable Jon boats and dinghies that feature a shallow V hull perform better in moving water, but less so on flat water. Portable Inflatable dinghies are very wide, and designed to go in moving water, but these boats are not comfortable. What is the most portable boat? At slightly less than 100 lbs, the Wavewalk S4 is the world’s most lightweight boat for a crew of more than two adult passengers, and it also features a fully rigid twin-hull that requires neither inflation nor assembly. These two facts combined make the S4 the world’s most portable boat. What is the most stable portable boat? For a boat that requires neither inflation nor assembly, the Wavewalk S4 is the world’s most stable in its class. With a load capacity of over 600 lbs and a saddle seat that’s similar to the seat of large-size high performance personal watercraft (PWC), this patented boat can carry up to three adult passengers on board – all of them standing up. What is the most seaworthy portable boat? This question is more difficult to answer, since many inflatable and rigid-inflatable dinghies are very wide and designed to go in rough water. However, for a rigid hull portable boat, the Wavewalk S4 is the most seaworthy. Typically, portable boats feature simple bench-like seats, or basic swivel seats. None of these seating accommodations is particularly comfortable, and they don’t offer good means for a user to balance themselves. In contrast, the Wavewalk S4 features a saddle seat that prevents back pain, and allows for easy, natural, intuitive, and fully effective balancing, even in rough water. Both the driver and passengers of the S4 can ride (straddle) the saddle while facing forward, or sit side-saddle while facing sideways. This is true even for a big and heavy person who weighs more than 300 lbs. What is the most versatile portable boat? Hands down, the most versatile portable boat is the Wavewalk S4, since it works perfectly in a non-motorized mode, both with canoe and kayak paddles, in a solo and tandem mode, and it features a frontal casting deck, as skiffs do. Being most seaworthy, the S4 can serve as a perfect tender for a yacht or a big motorboat, and it can be effectively towed behind the mother ship, as well as hauled on board. Thanks to the revolution in electronics and portable phones, we’ve learned to accept the notion that smaller can be better. In the world of recreational and sports fishing, kayaks have replaced many boats, or at least they’ve replaced many canoes, pirogues, etc., which served for decades as popular alternatives to boats. Fishing kayaks’ success is due to their lower cost of ownership, portability, and good shallow water capabilities. But kayaks’ lack of stability combined with their poor ergonomics and dismal range of travel prevents them from challenging the dominance of the full fledged boat. Indeed, the typical boat that people fish out of can be a bass boat, a Jon boat, or a skiff (flats boat), but in any case, it offers enough room and stability for a crew of at least two anglers, and it offers to take them out on long trips, in good or acceptable comfort during transit and actual fishing. When it comes to boats, the bigger the better. Not necessarily. Bigger boats can take more passengers on board, they are stabler and more comfortable compared to similar but smaller boats, and they are less problematic in choppy waters. And when boating is concerned, speed is fun, and so is having guests on board, and this is why bigger boats rule. Without going through the clichés about a boat being a money pit, and the day you sell your boat being one of the happiest days of your life, economic factors are worth consideration in terms of dollars and time, with the latter sometimes being more important – The total number of hours a boat owner spends on the water fishing is not that big, which is why every hour spent on unwanted activities such as maintenance, transportation and waiting in line at boat ramps counts more, and makes the ownership of a full fledged boat less attractive. The alternative to transporting the boat on a trailer is paying for a docking spot in a marina, or for dry storage, but these just transform one problem into another, without offering much flexibility in terms of places that you can can go fish in. Flat bottomed boats such as Jon boats and skiffs are great for going in flat water, except when it comes to their reaction to other boats’ wakes, which leaves much to be desired. 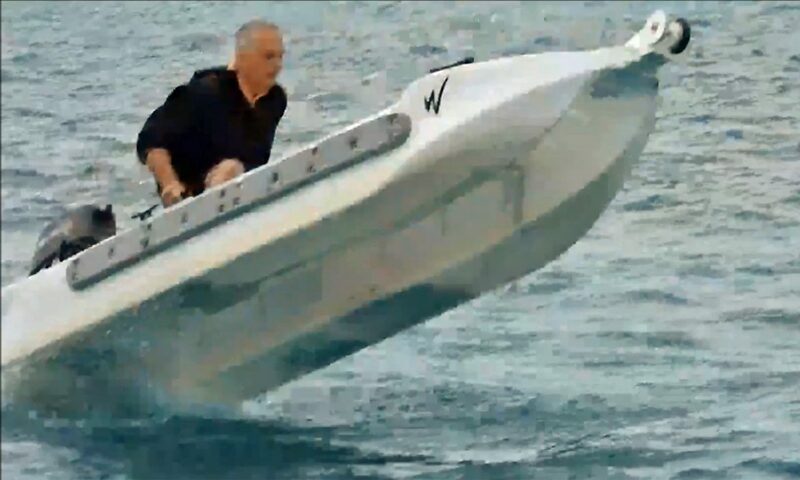 This lackluster performance, coupled with the fact that such boats do not fare well in choppy water and rough weather, makes them basically fair weather watercraft for inland fishing. Smaller boats can be an alternative to a big boat, but not necessarily a good one. By small boats we mean portable boats, namely ones that do not require a trailer for transportation. The ability to launch elsewhere than at boat ramps is important, as it frees the owner from wasting precious time, and the likelihood of being stranded in a small boat is much reduced. Still, typical small boats are not paddle craft, and this means that they are practically useless if the water is too shallow or too rich with vegetation for their motor to run properly. Other disadvantages of small boats compared to big ones are that they are tippy, far less uncomfortable, and some, like a motorized board whose name includes the word skiff for some reason, do not allow for more than one person on board, and such self inflicted solitude is kind of sad. It is true that fishing buddies can be annoying, sometimes, but that certainly doesn’t mean that you’d want to deprive yourself of their presence at all times. Price wise, the S4 costs a fraction of the price of a full size Jon boat or skiff, and not just thanks to the fact that it does not require a trailer for transportation. The Wavewalk S4’s Polyethylene twin-hull is maintenance free, as it requires neither cleaning nor painting. 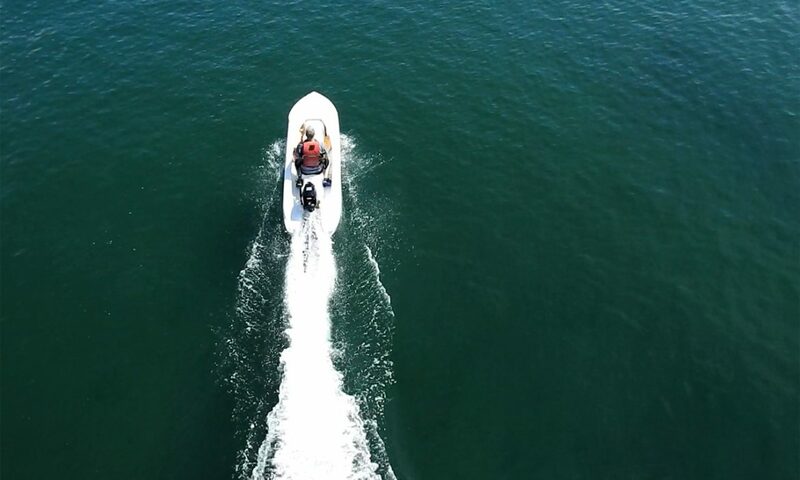 The S4 provides better stability than bigger boats do, thanks to the combined effect of its catamaran hulls and the saddle seat that allows the user to balance themselves in the most easy, intuitive and effective way, similarly to the way the users of personal watercraft and ATV drivers do. The S4 is more seaworthy than flat bottomed Jon boats and skiffs. As far as the number of crew on board, the S4 can accommodate up to three fishermen on flat water, and two fishermen in rough waters. Fishermen on board can fish standing. The S4 works perfectly as a paddle craft, both with kayak and canoe paddles. This means that its users are not limited by the draft of its outboard motor, or the need to protect its propeller from vegetation. The likelihood of an S4 getting stranded is lower than that of any other watercraft. The Wavewalk S4 can be launched almost anywhere, including rocky, muddy and sandy beaches, marshes, sloped terrain, etc. It can also be outfitted with a mud motor, similarly to Jon boats and skiffs. Speed wise, the S4 cannot compete with a full size Jon boat of skiff powered by a big and powerful motor. But the S4 outfitted with a portable, 6 HP outboard can go at speeds attaining 18 mph, which is pretty good for most fishing trips that do not require traveling over excessively long distances. The S4 has a 650 lbs load capacity, which is impressive for its small size, and even more so for its extremely light weight, which is 98 lbs without a motor, but this payload is still not as much as a large size Jon boat or skiff can carry. Captain Larry Jarboe operates a small fleet of Wavewalk 700 and S4 fishing kayaks, as well as two commercial fishing boats, out of his docks in Key Largo, Florida. He uses these kayak – skiffs and boats to provide fishing, diving and touring guide services to tourists and local residents of the Keys and southern Florida. 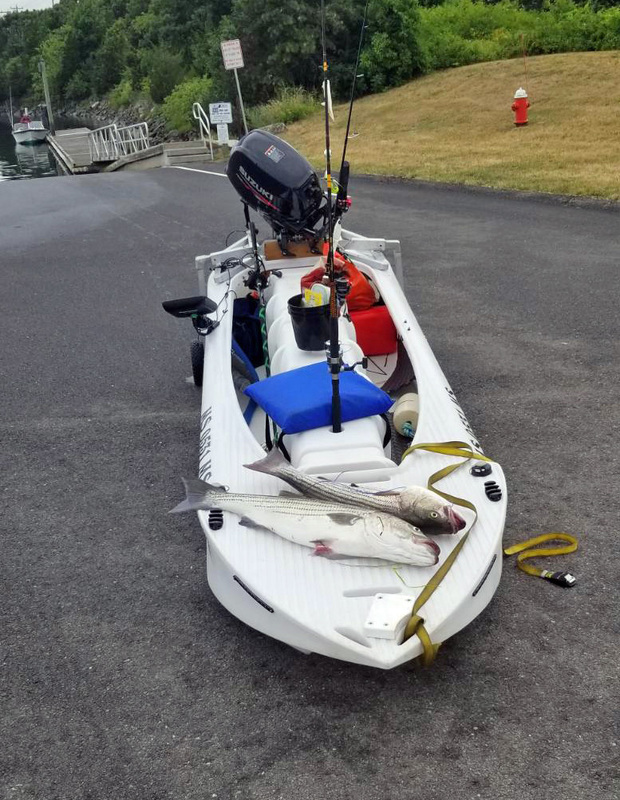 Captain Jarboe, a master tonnage captain, has become increasingly aware of the commercial potential of the Wavewalk S4 kayak skiff for his business, both as a paddle craft (canoe / kayak) and motorized with a portable, lightweight outboard motor. But he also found a way to take this high performance and extremely versatile skiff to a higher level, namely use it to comfortably transport a number of passengers that he could have previously transported only in a full-size fishing boat. He created a multi-boat watercraft composed of three Wavewalk S4 skiffs attached in parallel. The middle one is motorized, and the two skiffs on the sides are attached to it by ropes that can be easily detached in case the passengers feel like continuing the journey by themselves, independently, whether in a paddling mode (canoeing or kayaking), or in a motorized mode. In technical terms, this modular watercraft is composed of three catamaran kayaks. It can take up to six adult passengers – three in each of the side boats, plus the captain, who’s driving it from the middle boat. Its total load capacity is close to 2,000 lbs, which is the equivalent to the load capacity of a fairly large leisure boat, or skiff. The passengers can sit in various positions, and stand up anytime they want. Captain Jarboe experimented with various configurations of this boat, and he found that attaching the two side boats slightly in front of the central boat provided optimal results as far as control goes, and minimizing spray intake from the bow. This modular watercraft is extremely stable and seaworthy, yet nimble enough to allow for trips in the mangrove creeks around Key Largo, as can be seen in the video. In a broader sense, this new concept opens new possibilities in leisure boating, namely using the same smaller boats separately as kayaks (under paddle) or skiffs (motorized) for crews of one to three persons, and as a multi-passenger boat with room on board for up to nine adult passengers, for leisure and fishing trips and for entertaining guests, family, etc. In other words, instead of having a big and expensive pontoon boat attached to your dock, plus a multiple canoes and kayaks, you could have use three Wavewalk S4 kayak-skiffs, and easily create an ad-hoc big boat out of them anytime you need to. Captain Jarboe’s innovative concept also opens the door for guides on a budget, who can operate a fleet of small, very shallow draft and relatively inexpensive boats that offer a wide variety of services, rather than a big and expensive boat that offers a limited range of services, and is also limited to traveling in much deeper water. In other words, Captain Jarboe’s multi-boat dubbed S4x3 can be used by groups of fishers who need to cross rough waters on their way to fishing the flats, or mangrove creeks, and back from there. The advantage of this concept over using big motorboats is the ability to fish shallow water without fear of reefs, oyster beds, sand bars and low tides. Its advantage over using kayaks is the bigger range of travel, better comfort, better stability, and many times more storage space – both in a joint configuration and separately.